The design looks like something a 10-year-old girl came up with, it's just lacking some pink. But I'm sure it will serve the purpose of protecting his head just fine. With de la Rosa gone and Hamilton changing the design, I think only Webber has has original helmet design, correct me if wrong. Massa's and Button's are quite different to what the started out with. Its the silver edged red part that completely kills the Lewis design. It was just bad, but with that it is terrible. JLF usually do good designs, I think its the worst design i've seen in F1 in a long time. It's really not that bad. More cluttered but the worst? It is a matter of opinion of course, but ..well, villeneuve. Vettel's had some real howlers. The one with lights last year was pretty horrific. Anyway, OT - Some great looking helmets so far. The good thing with all these new drivers is we get to see some new designs too! I'm surprised Lewis was able to keep using an Arai with Mercedes. Schuberth is a big time technical partner for Merc and Ferrari. 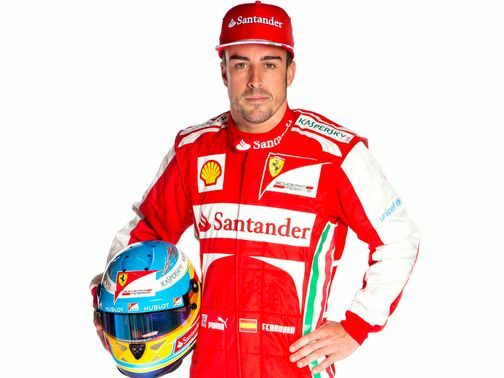 Alonso was a long time Arai user and had to switch to Schuberth when he went to Ferrari. I don't care for Lewis' new design either. Too busy. i have heard him say himself that he has always used a yellow green helmet because he always worshipped senna and that it is comprises of the flag colours of Grenada and that his dad demanded he wore a brightly coloured helmet so he could spot him when racing karts so those colours seemed to be the obvious choice. Has rosbergs helmet changed this season i haven't seen a picture as of yet? Or one of Alonso or massas i don't think for that matter. I was expecting that, too. 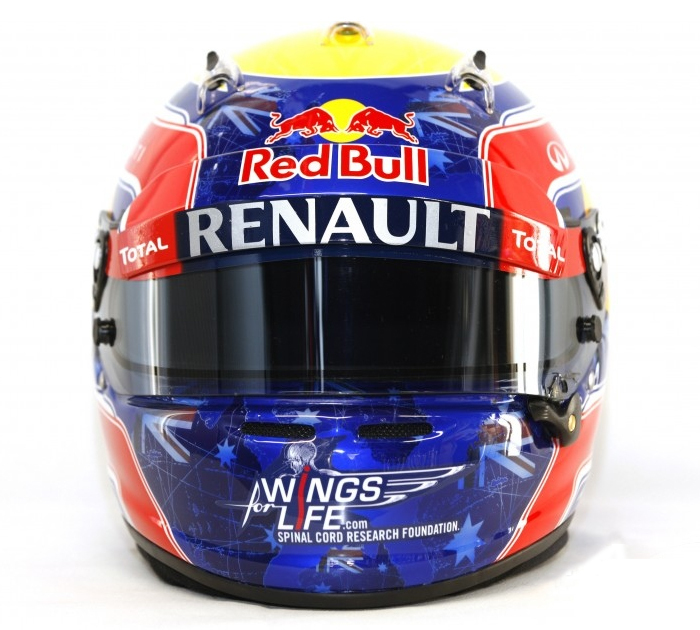 But I'm glad he's stuck with Arai as they're the nicest shaped F1 helmet. Schuberth are second and those horrible bulbous Bell ones with the "bib" are the worst looking. Well, and this is what annoys me about Hamilton at times, he has said in some interviews he and his dad chose it so it would be easier to pick him out when he was karting. However in other interviews he's said his hero was Senna so he picked it as a tribute (or words to that effect). In an early interview (when he was a teenager) he said his main heroes were Schumacher, Coulthard and Häkkinen and he'd like to be racing against them in a few years. Since he's entered F1 he seems to deny being a fan of Schumi's as it's suited him. It's almost like now he's made it he comes across a bit more arrogant or perhaps he's always said what sounded best to the interviewer at the time - hence the two differing helmet stories. Can Hamilton do ANYTHING without some slating him?? Some people taking helmet designs way too seriously! Loving Kimis helmet, very nice! It's just people must get used to it. Both of those helmet stories are true, confirmed numerous times in numerous interviews. Last year Hammy said that he always looked up to Kimi too. Vettels, well there's no real point in showing, it will change at least 15 more times before the season starts. 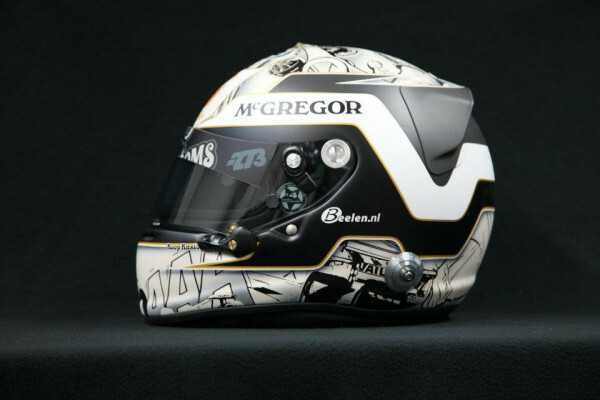 Estaban and Hulkenberg's helmets are beautiful. Hamilton's I didn't find as repulsive as people are making out... though I'm not a fan of the silver edging on everything. Kimi and Romain's are nice too. Webber's is... well its the same which is good. Di Resta's is my least favourite, it just looks uninteresting and forgettable, like Di Resta really. Poor guy, even his helmet is uninteresting. I want to see if Massa will keep the red helmet from Brazil, he really should, it was lovely. unfortunately Ferrari don't usually give pr shots of their helmets so will have to wait until testing tomorrow i guess. I can wait another day. Last edited by potter84 on Mon Feb 04, 2013 10:31 am, edited 1 time in total. Good point. Hmmm, well I have no choice but to wait haha! Shots from Merc's twitter show Rosberg with pretty much the same helmet. I completely read that the wrong way then. As AngusWolfe said above, it may be really hard to tell Rosberg and Hamilton apart when watching on the telly...both helmets are predominantly yellow with similar "monster" sponsoring around the crown. I meant the same as in the same as last year, but yeah, it might be pretty hard to tell them apart come Oz. I remember seeing Van Der Garde's helmet from a couple of years ago and thought it was pretty awesome, glad he's still got an awesome one! Wow almost justify's his place on the grid! I like it, plus it'll blend in well with the green of the car. Wow! Roman's head is really big compared to Kimi's! EDIT: Triple post. Yay me.